Moments before 8 a.m. on December 7, 1941, the United States was ‘suddenly and deliberately attacked.’ Hundreds of Japanese fighter planes and bombers launched a surprise assault on Pearl Harbor in Hawaii. The swift, devastating volley on the U.S. naval base killed 2,403 Americans. With President Franklin D. Roosevelt’s famous “a date which will live in infamy” proclamation, America had finally joined WWII. That momentous week of loss and defiance took place seventy-five years ago. After Pearl Harbor, the U.S. fought Imperial Japanese forces for a superior hold in Pacific waters. On the list of the 10 greatest battles of that front, you will find Midway, Coral Sea, and the Philippine Sea. GPO makes available a U.S. Naval War College study, Major-Fleet Versus-Fleet Operations in the Pacific War, 1941-1945, that takes a look at those three major naval operations. Japanese planning in the Pacific War, according to author and naval historian Dr. Milan Vego, was unnecessarily complicated and focused too closely on offensive maneuvers. 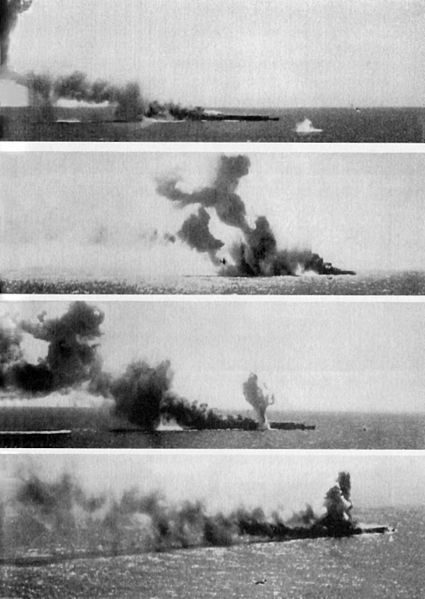 Nonetheless, Japan was hell-bent on defeating the U.S. Pacific fleet. American military intelligence, and eventually the entire fleet, prevailed. The book’s primary-source archival material points to the timely concentration of U.S. forces at the appropriate place and at the appropriate time. The U.S. dominated the resultant Coral Sea, Midway/Aleutians, and the Philippine Sea battles—victories that presented a big sea change in the Pacific theater. The author provides a detailed, well-supported sketch of three major battle areas that decisively shaped WWII. Maps, strategic context, and action analysis provide an authoritative, insightful resource for naval professionals. Major-Fleet Versus-Fleet Operations in the Pacific War identifies universal, tactical lessons of interest for today’s U.S. Navy and, of course, military history buffs. Moments before 8 a.m. on December 7, 1941, the United States was ‘suddenly and deliberately attacked.’ Hundreds of Japanese fighter planes and bombers launched a surprise assault on American soil at Pearl Harbor in Hawaii. The volley on the U.S. naval base was swift and devastating: 2,403 Americans were killed, and another 1,178 were wounded; American battleships sunk; other ships irreparably damaged; and almost 200 U.S. aircraft were destroyed. 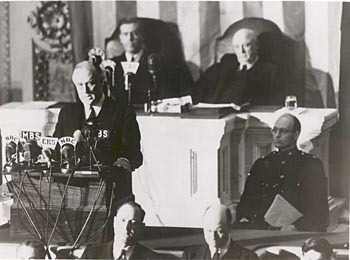 The next day, President Franklin D. Roosevelt asked Congress to formally declare war against Imperial Japan. It was then that Roosevelt spoke those famous words, proclaiming December 7, 1941 “a date which will live in infamy.” America had finally joined WWII. That momentous week of loss and defiance took place seventy-four years ago this month. The GPO makes available a variety of gov docs that reference the historic Pearl Harbor attack. And finally, shop the GPO online bookstore World War II collection. Click on the Links: For the free resources, click on the links above in the blog post. In the Compilation of Presidential Documents, view the Proclamation of National Pearl Harbor Remembrance Day. These are just some of the many examples of Federal Government documents that reference the historic Pearl Harbor attack. Explore FDsys for other examples from collections such as: Congressional Bills, Congressional Reports, Public Papers of the Presidents, United States Court Opinions, and more. Another great resource for documents produced by the Federal Government on Pearl Harbor is GPO’s Catalog of U.S. Government Publications. 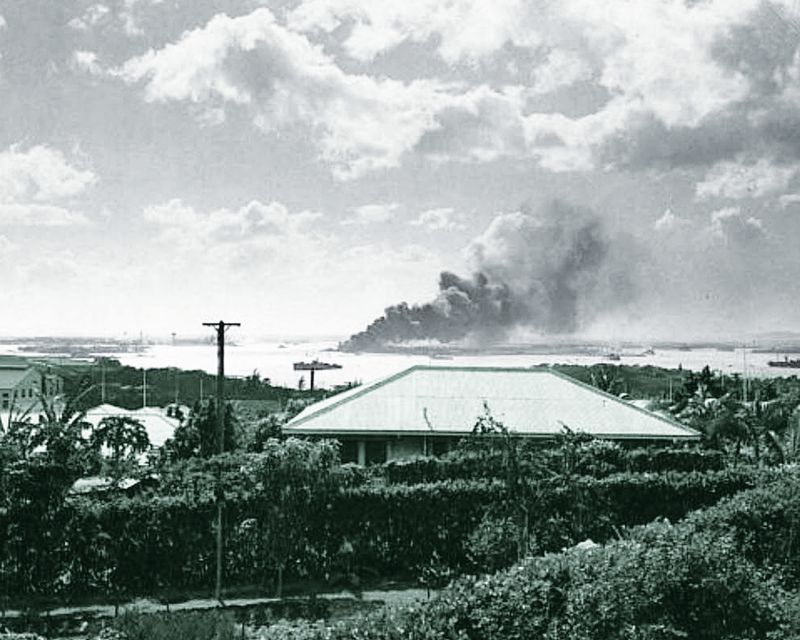 First Army photo of the bombing of Hawaii, 7 December 1941; the battleship USS Arizona in background is on fire and sinking. Another interesting read is also from the National Security Agency’s Center for Cryptologic History is called, “West Wind Clear: Cryptology and the Winds Message Controversy: A Documentary History.” This documents the history behind the theory that the “winds message” was received by the United States as a warning that the Japanese were going to attack Pearl Harbor. Also of interest is a document from the Combat Studies Institute Press, “Staff Ride Handbook for the Attack on Pearl Harbor, 7 December 1941: A Study of Defending America.” The publication allows for study of the battle, not only in context of the Japanese attack, but also in the context of the issues that are relevant to the global war on terror. It is available from GPO’s Catalog of U.S. Government Publications as parts 1 and 2. 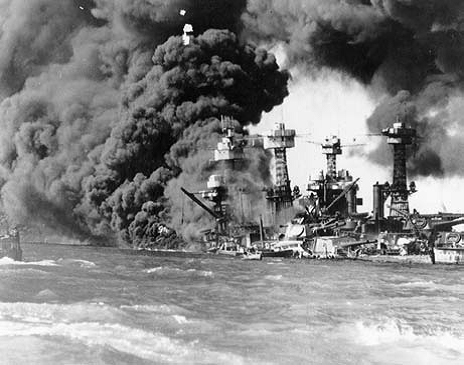 Pearl Harbor Attack, 7 December 1941 USS West Virginia (BB-48) afire forward, immediately after the Japanese air attack. USS Tennessee (BB-43) is on the sunken battleship’s opposite side. Another publication of note is, “7 December 1941: The Air Force Story,” from the Pacific Air Forces Office of History. This was published for the 50th anniversary of the attack and details the Air Forces’ story from that fateful day. Shop the GPO online bookstore World War II collection here. How can I access these publications? Librarians: You can find the records for most titles in the Catalog of U.S. Government Publications (CGP). About the author: Our guest blogger is Kelly Seifert, Lead Planning Specialist for GPO’s Library Services & Content Management Division that supports the Federal Depository Library Program. If you’re a history buff like me, a good historical mystery or controversy can make for excellent reading, even if you have doubts as to how mysterious or controversial the subject is. For example, did the American Government and President Franklin Delano Roosevelt have advance information about Japan’s attack on Pearl Harbor and was this fact later suppressed, either to conceal incompetence or because the President wanted an act of aggression to force American into war with the Axis Powers? One of the most written-about pieces of this historical puzzle is the so-called “West Wind Execute” message, Japan’s code phrase to advise its diplomats abroad that an attack on America was imminent. 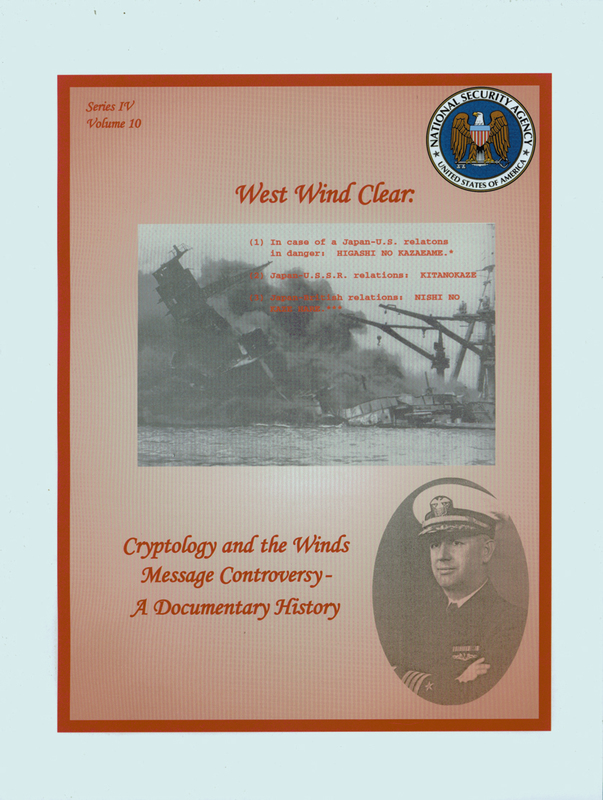 In West Wind Clear: Cryptology and the Winds Message Controversy – a Documentary History, the National Security Agency’s Center for Cryptologic History has tackled the complex history of this message, when it was sent, and why its existence or non-existence has exercised the imaginations of academics, amateur historians, and conspiracy buffs since the 1940s. Crucially, it includes many key documents, some never before published, dealing with the voluminous Japanese signals traffic leading up to the Pearl Harbor attack and the timing of signals interception and decoding. The thrust of West Wind Clear, which is backed up by meticulous and extensive research and documentation, is that the Winds messages did exist, but they were only one string among many Japanese communications instructing diplomats to burn their code books and take other 11th hour measures to prepare for war. In fact, the actual West Wind Execute message was broadcast after the attack began. The authors state that the main source of continuing debate over the “who knew and when” question resulted from a number of contradictory statements by a well-respected American cryptographer, Captain Laurence Safford, USN, whose reliability as a witness was undermined during the hearings of the 1946 Joint Congressional Committee investigation of the Pearl Harbor debacle. He was unable to produce any documentary evidence and was shown to have changed his story of a pre-December 7 West Wind Execute message numerous times. Despite these findings from a committee whose members included some who gladly would have found neglect or malfeasance at the root of the Roosevelt Administration’s handling of the run-up to war, the West Wind controversy has persisted in popular accounts that lent credibility to the stories of Safford and Ralph Briggs, a radio operator who many years after the fact claimed to recollect a West Wind Execute message before the attack. West Wind Clear makes a strong and well-documented case against a suppressed warning of war. For conspiracy theorists, who tend to operate within a closed intellectual system, no evidence is convincing enough, but to me, this story of bureaucratic confusion, stress, and misunderstanding seems much more authentic (and common) as an explanation for “the fog of war” surrounding the Winds messages. You can read this book here, order your own copy here, or find it in a library.